Everyone is creative, inventive, and imaginative. Dragon Hall’s Tech Hub is ‘Bridging the Digital Divide’ by enabling all children & young people to discover, make and hack the future through new and developing technologies. Tech Day (Tuesday 17th June 2014), part of London Technology Week marks the official launch of Dragon Hall Tech Hub. The event was sponsored by The Mayor’s Fund, Santander & London Youth with the Hub itself being funded by LB Camden’s Innovation Fund. There was a range of ‘discovery’ activities and workshops in 3D Printing, Augmented and Virtual Rality, Application Development, Coding, Internet Radio, Raspberry Pi and more. A range of Tech Allstars supported the event including 3Doodler, Altergaze, Code Club, Samsung, The Restart Project, Stemettes, Technology Will Save Us and Ultimaker UK. Tech Day gave children, young people, parents, teachers, youth workers and anyone else interested the chance to explore world leading technologies and to consider how they can enhance learning and development for all. Dragon Hall has a strong track record of engaging the most vulnerable, disenfranchised children and young people in society, providing activities that promote inclusion, social justice and enable them to realise their potential – as seen in the RadioActive 101 internet radio project. This educational intervention has enabled participants to locate and use their voice effectively, involving 170+ children & young people from 8 London Boroughs and 5 countries who come from a range of vulnerable & marginalised groups including: learning disability; homelessness; mental health; LGBT, BME and young women. Technological developments change the way we view the world and how we interact with it, they define the future. We believe that our young people need to experience in as ‘hands on’ a way as possible to become comfortable with new ideas and the pace, and excitement, of change. We want to offer an opportunity to access as much new technology as possible, to create things with a 3D printer, to learn how to code, to be given the tools to build robotics, to design virtual reality games – whatever it takes. We have created an Innovation & Technology Hub at Dragon Hall, to put cutting edge technology in the hands of our young people – helping them to understand, create and innovate. CV writing sessions, job searching, work placements are not enough, we have to give our young people the opportunity and the skills to create the future. We need to put young people in front of every new advance that we can and then let them show us what they want to do with it. Our plans are to develop the Hub to enable people of all ages to access cutting edge technology in a fun and creative environment, to keep the activities free or at an affordable cost and to involve everyone in the digital wonders that just keep on happening! Meta Space Glasses. 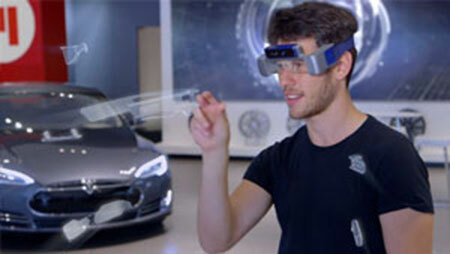 The world's most advanced interface Personal Holographic Interface: Real Time 3D Scanning Input, with 3D Display Output on top of the real world. 3D printing is a process of making a solid object of virtually any shape from a digital model. It is an additive process where successive layers of material are laid down in different shapes. 3Doodler is the world’s first and only 3D Printing Pen. Using ABS plastic, 3Doodler draws in the air or on surfaces. It’s compact and easy to use, and requires no software or computers. You just plug it into a power socket and can start drawing anything within minutes. We are talking about stuff like these Space Glasses – a Doodle pen that enables you to draw in 3D, makey makey, Raspberry Pi, coding with Code Club and a whole host of other amazing things! Check out Kickstarter for inspiration! UK businesses are set to benefit from a £14.7 million investment to develop 3D printing projects. The Technology Strategy Board the Engineering and Physical Sciences Research Council, the Economic and Social Research Council and the Arts and Humanities Research Council are investing £8.4 million into the projects that will leverage in an additional £6.3 million of private investment. The funding will help businesses to develop new manufacturing solutions in 3D printing technology across industries such as healthcare and energy. As part of the Industrial Strategy the Government has committed to support ground-breaking technologies that are often too risky or resource intensive for individual companies to nurture on their own. Vince Cable said: ‘Investing in tomorrow’s technology will bring jobs and economic growth throughout the UK. That’s why last month the Government announced the biggest ever investment in the work of the Technology Strategy Board. With £440 million of funding they will support new manufacturing techniques to maintain the UK’s position as a world leader in technology and design’. Dragon Hall believes we have to invest in our young people now so they can use tomorrows technology to create the future for all of us.